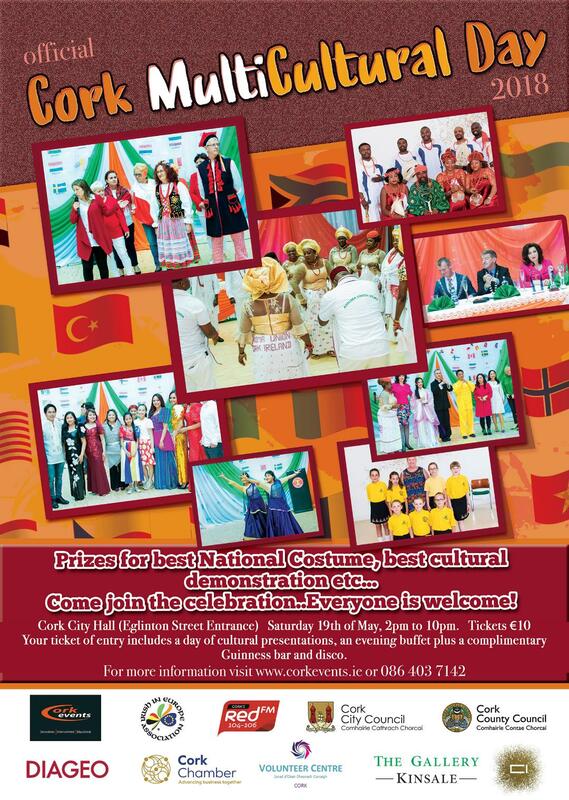 The Official Cork Multicultural Dayis taking place at Cork City Halls Millennium Hall on Saturday the 19th of May from 2.00pm and it promises to be something very special. On the back of last years success the event is fast becoming a key annual event on the city and county social calendar with considerable public, business and media interest in this years celebration. Backed by both City and County Councils, sponsored by Diageo, The Gallery Kinsale and supported by the Creative Ireland Programme , an all- of-government five year initiative from 2017 to 2022, which places creativity at the centre of public policy this event is sure to be a resounding success and enjoyable spectacle. Media partner for this years event is local radio station Red FM who will have plenty of reports and updates on this years celebration. An event for all generations it is also an opportunity to enhance cultural awareness and to remind people of the similarities and differences among cultures. 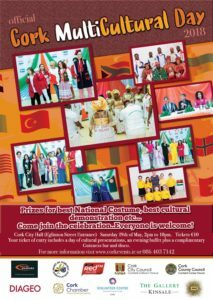 A not for profit event with the support of Cork Volunteer Centre and Cork Chamber of Commerce, the day is a full days activities of cultural presentations commencing at 2pm followed by food and music for the evening. Each cultural group is invited to give a demonstration or performance of something related to their heritage/culture, be it a song, dance, reading, traditional dress or what ever they wish. After the performances the judges cast their votes on the various categories followed by the awarding of prizes and then a complimentary Diageo bar with music into the night. Co-orgainisers of the event, CorkEvents.ie along with The Irish in Europe Association have been running the event for the past seven years in recognition of the contribution of the various communities to Ireland. They are delighted to see all these key stake holders give recognition and support to these new and existing communities and their contribution to Cork as well as Ireland. Cordelia went on to say “Cork has the second largest concentration of immigrants in Ireland and we are trying to bring them together with the Host Country under one umbrella by means of organising this multi- cultural event”.